Continuing our tradition of category leading innovation, we have developed a new brake pad to deliver whisper quiet braking, silky smooth operation and noticeably less dust. The top moving Bendix General CT references are now cloaked in STEALTH Advanced Technology. Bendix engineers have used high tech laser and dynamometer equipment to study the surface contact between each individual brake pad and rotor, and identified the optimum contact surface area. The result is STEALTH Advanced Technology. These new diamond cut pads have no radial features so they do not sustain vibration from contact between rotor and friction. They are engineered to transfer the caliper force where it is needed, providing the most effective surface contact for unrivalled stopping performance. 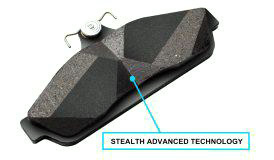 The result is STEALTH: the quietest, smoothest, and cleanest pad we have ever created.